This is the final installment of our friend Kristine’s Cool Oaxaca Blog—¡qué sonido tan triste cuando se acaba! She’s given us a wonderful glimpse into life in Mexico; we hope to see more of her soon. ¡Muchas gracias, Kristine! Interesting developments here. We have been helping Rebecca (our property owner and wife of Tony) rescue a dog (Rebecca rescues animals and has a full blown operation going here at the farm where we’re staying). Over the last three weeks now, we’ve been searching for the dog in our car. 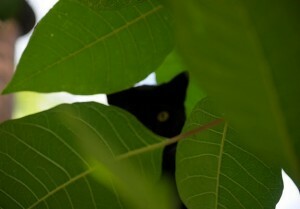 When we find her, we coax her to eat (we carry cans of dog food in our trunk). The dog is a female, very gentle and shy, easily dominated by other dogs, and was literally starving before Rebecca and her “team” (us and our neighbor, Mary) went to work to save her. We’ve been able to get medicine for worms and fleas into her food and wiped some disinfectant on her for the flies that had taken up residence on her back. We’ve watched her go from too afraid to approach us at all, to approaching and quickly wolfing down the food and then running away, to eating while we touch her a little bit, to taking food out of my hand ever so gently. Three days ago she ran up to us with confidence and wolfed down the food. Two days ago when Rebecca left in her car after feeding her, the dog ran after her car! Later that morning, after three weeks of gaining her trust, Rebecca and the Vet were able to put a leash on her and carry her to their car. The Vet examined her carefully and said she was about 1.5 years old and has had at least one litter of puppies. She has lost her front teeth, probably, the Vet said, from trying to eat rocks for sustenance. They were her permanent teeth so they will not grow back. But otherwise her health is fine, and he has already had her vaccinated and spayed! I’m besotted with the dog now — we already have a name for her….Oaxaca. I think that may be a cheesy name if she stayed here in the state of Oaxaca, but in Guanajuato, it will be a cool name. 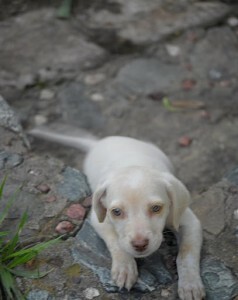 Well, at this moment I am waiting for our new dog, Oaxaca, to be delivered by the Vet. Our mutual adjustment period is about to begin…. Oaxaca's first morning at the casita. Oaxaca, the dog we recently rescued from the streets, easily adapted to being in our casita but spent most of her first days in her bed. One morning, while I was working at my desk in the living room, I heard growling and hissing coming from the kitchen, then a scramble—I looked up to see two cats dashing toward the bedroom followed (too closely) by a big white blur nipping at their heels. The dog and cats are now at a standoff. No more feeding the cats in the kitchen. Even when her bowl is empty, Oaxaca patrols that kitchen entry like a sentry. Having said that, Oaxaca is not a neurotic dog and her transition to civilized life has been very fast, indeed. The first two days with us she inhaled her food (I didn’t hear ANY chewing!) but once the food began to appear on a regular schedule, she started to eat normally. She was a bit slow to respond to affection, though. We petted her but she just looked at us rather blankly, her tail tucked between her legs. I imagined she’d learned not to trust the behavior of humans, even acts of kindness. Rebecca who, with her husband, Tony, own 40 acres of property in the countryside just outside the city of Oaxaca, has been running an animal rescue operation on her property for several years. She has rescued large and small animals– horses and burros, cats and dogs. To date, she has two kittens and four puppies waiting to be adopted and has kept for herself eight adult dogs (because adult dogs are almost impossible to place in homes). She calls her business “Megan House” in memory of her first and most beloved dog, Megan, a German Shepard with a great personality that she rescued from the streets of her pueblo. Rebecca and Tony live on the outskirts of San Pablo Etla and, like many pueblos in Mexico, the village is filled with stray dogs roaming the streets in search of food. Some of the dogs are in bad shape, like Oaxaca, and when Rebecca identifies one of those dogs, she and her local Mexican Vet, Luciano, go into high gear. 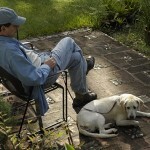 They begin by feeding the dog and gaining its trust, often mixing medicine into the dog’s food. 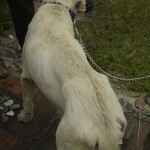 Eventually, they transport the dog to the Vet’s office where it is spayed and further treated, as needed. Sometimes the dog is released back onto the streets but if a dog is too ill, Rebecca takes it to her kennel at home. Occasionally, it becomes part of her family. As a result of their efforts, this team of two has transformed the pueblo—improving the lives of many dogs and preventing overpopulation through spaying. To call Rebecca’s dog rescue operation a business is a bit of a stretch; in fact, it is a charity, financed by Rebecca and Tony. The word has gotten out about Rebecca’s efforts and now people regularly bring her animals they find discarded on the streets, such as puppies and kittens too young to survive without their mothers. The GOOD news is folks also regularly appear at Megan House looking to adopt animals. I think you have to be a bit crazy, as well as a saint, to do the work Rebecca does. She is totally focused and will not retreat from any dog who needs her help. Mexicans generally care for their pets but in one instance, Rebecca found a sick dog, owned by a local family, who was being terribly neglected. Instead of turning her attention elsewhere, she engaged Luciano (the Vet) as cultural mediator and translator and approached the family about their dog’s poor condition. She offered to pay for the medical treatment the dog needed and later, when the dog was on the mend, she and Luciano educated the family in how to care properly for it. Now that takes chutzpah! wanting to be separated. Other than growling at the cats, that was the first time I’d heard her voice. Later that afternoon, I was working at my desk and Oaxaca was, as usual, lying in her bed. After awhile, I felt a nose pushing its way under my right arm. I looked down. It was Oaxaca. She was wagging her tail. I got down on the floor and folded my entire body over hers, giving her a big bear hug. She groaned, wagging her tail faster, then let out a big sigh. I think that was the moment we fell in love. When I rescued Oaxaca, I was so focused on what I was doing for the dog that I did not realize what the dog was doing for me. Now our vacation is over and Oaxaca is back home with us in San Miguel de Allende. On our vacation, we visited an archeological site and explored some artisan villages but we didn’t go birding and we never made it to the coast. We were too busy spending time with wonderful people and learning about their lives in Oaxaca—Rebecca and Tony, Mary and Bill, and Penny and Victor (who are in the process of buying a house near Casa Raab). We learned all about homemade mezcal distilling and hiked through Tony’s maguey fields. And then there were those gigs, singing and playing the bass with the Bodega Boys. You can use a guidebook to help shape your trip, but you won’t find any of these adventures in a guidebook. Most important, there was the business of rescuing our new dog, Oaxaca. We always knew we would be bringing home crafts and things from our travels—you know, rugs and pottery and stuff. But we never imagined we’d be bringing home a dog! 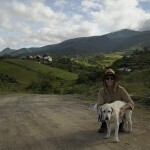 New Guest Blogger + Cool Oaxaca Blog (Part 1): Welcome, Kristine! What a lovely, touching, sweet story! thank you so much, Kris, for sharing this bit of magic. Truly a heart-warming story. Thanks for sharing it. You’re written an enchanting story about Casa Raab, the Oaxaca countryside and the grace of animal rescue. Thank you so much for inspiring me to return to Mexico and experience more of its beauty. 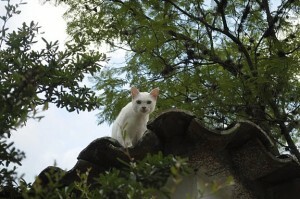 I’m not sure which is most inspiring in your story; the beauty of Oaxaca or the animal rescue. So, I’m going to say that they are equally inspiring and I will thank you for both in equal measures. Is there any chance that you could give me the contact information for Rebecca? I have found a kitten with a broken leg who desperatly needs help but I will be returning to Canada on Saturday. I am living in Mitla and could get a bus out to Etla if she would be willing to help. Please respond as soon as possible, I have been looking for a place to take this kitten and am getting desperate. It is hard to believe Oaxaca was that thin.!!! You are wonderful parents to adopt her. I am glad I got to meet here. Maybe she and Ted(our dog) will become friends.